This Biloxi, Mississippi couple decided to get married here in the great city of New Orleans, and they were a joy to work with. 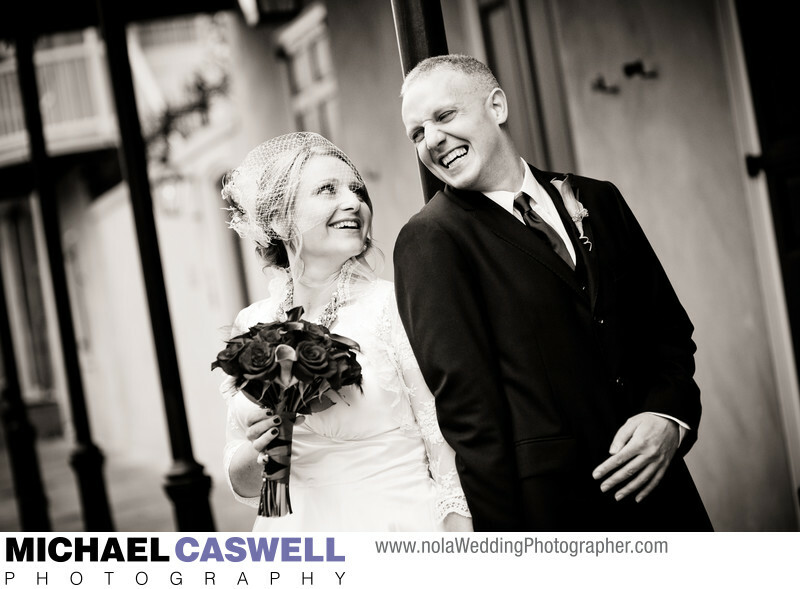 Their wedding ceremony and reception both took place at Broussard's lovely and spacious courtyard in the French Quarter. But first, we began with the couple having an emotional first look at that location, which allowed us the time to then hit the streets for a little while for a quick portrait session of just the two of them before the ceremony, while there was still some good usable light outside, which would not have been the case had we waited and done these portraits later during the nighttime reception. My favored method of posing a couple, whether during engagement portraits or on the wedding day, is to pick a nice setting with good light, and just have them pretend like I'm not there as they talk and laugh together. This couple nailed it perfectly. Location: French Quarter, New Orleans, LA.